St John's Episcopal Church in Aberdeen now welcomes hundreds of Muslims praying five times a day. 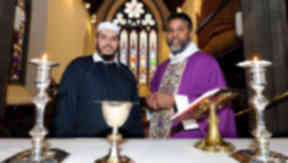 A Christian church has become the first in Scotland to share its building with Muslims. St John's Episcopal Church in Aberdeen now has hundreds of Muslims praying five times a day in their building as the neighbouring mosque was so small that they were forced to worship outside. Sections of the main hall have been handed over by Rev Isaac Poobalan to Chief Imam Ahmed Megharbi and his congregation and at busy times they even use the main chapel to pray. Although there have been cases of Christians allowing Muslims to pray in their Churches in parts of America, church chiefs believe it is a first for Scotland. Rev Poobalan, 50, said being surrounded by Islam while growing up in India helped break down the divide for worshippers of two religions praying together in Aberdeen. He said: "Praying is never wrong. My job is to encourage people to pray. The mosque was so full at times, there would be people outside in the wind and rain praying. "I knew I couldn't just let this happen - because I would be abandoning what the Bible teaches us about how we should treat our neighbours. "When I spoke to the people at the church about the situation, someone actually said to me this was not our problem, but I had seen it with my own eyes, so it was a problem. Chief Imam Ahmed Megharbi added: "What happens here is special and there should be no problem repeating this across the country. The relationship is friendly and respectful." The Bishop of Aberdeen and Orkney said he hoped their move could cause shock waves. He said: "It would be good to think we can change the world. Most of us most of the time feel we can't so don't bother. But sometimes, someone has a vision we can do something of global significance on a local scale. "This is what is happening between St John's and the mosque in its grounds. Everyone can do something locally and if more were to do so then something big might just begin to happen globally. That's why the eyes of the world are on Crown Terrace in Aberdeen."